Join this motorcycle tour with VietnamRider Travel from Saigon to Ha Noi. In the beginning of the tour, you will depart from Saigon and travel up to many beautiful and interesting places. 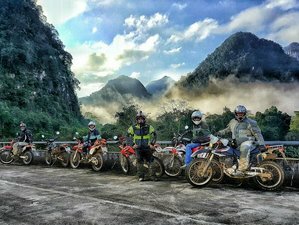 Some of the highlights are that you will ride through deep jungles as well as high mountains of Vietnam and ride along Cambodia border. Also, experience travel by the famous Ho Chi Minh trail which is one of the most beautiful roads in the central Vietnam! During this tour, you will be accommodated in a double, a twin, or a private room at standard hotels and homestays. This is your dream. Explore Vietnam by motorcycle tour. You can choose either to spend more time in the south or in the north depending on the rainy season. What you need for this trip is only the real passion of riding the motorcycle. It is recommended for you to book this trip in advance to get the best arrangement. Your tour leader will meet you on the first arrival day in Saigon to sign up your trip contract and for you to check all the equipment before the departure date. Pick up and depart at VietnamRider Travel. You can visit the Cu Chi Tunnel, you can do the gun shooting here (optional). You’ll travel by the small back-roads to the countryside to Mekong Delta. Here, you can choose to do a homestay with the local family on the Coconut Island or stay overnight at a hotel in My Tho. Ride through the Mekong Delta and learn about Angkor Borei. To explore this old and hidden historic land, you will do some boat trips in My Tho to Ben Tre and visit the Khmer villages and their 1,000-year-old temples in Tra Vinh - Soc Trang. Ride on the small roads through the green rice paddies and meet the friendly locals. You can choose to stay overnight at a hotel or do a homestay with the locals. You need to wake up at 06:00 to do the boat trip to explore the famous floating market in Cai Rang, farmers from the region bring their goods, fruits, and vegetables mainly to the markets and sell them to local dealers. These dealers sell the products to shops in the neighboring towns and to wholesale dealers from the big towns. Canals are here. It is the easiest and fastest way of transportation. You continue the tour and travel through small roads, about 50 kilometers off-road, and through the Mekong river to the Cambodia Border, where you’ll stay overnight at the 2 stars hotel. You’ll start to travel in some parts of the Ho Chi Minh trail from this location. The Ho Chi Minh trail was a network of roads built from North Vietnam to South Vietnam through the neighboring countries of Laos and Cambodia to provide logistical support to the Viet Cong and the North Vietnamese Army during the Vietnam War. It is a combination of truck routes and paths for foot and bicycle traffic. The trail is actually a 16,000-kilometer (9,940 miles) web of tracks, roads, and waterways. You’ll travel for about 100 kilometers off-roads through forests and come to stay in a small town on the 500-meter high mountain. The travel route is along the border between Vietnam and Cambodia. Along with this road, you can visit the national park with waterfalls where you can stay overnight. Kon Tum’s relaxed ambiance, river setting, and relatively traffic-free streets make it a worthwhile stop for travelers who intended on exploring the surrounding hill-tribe villages, of which there are 700 or so dotting the area, mostly Banhar, but also Sedang and Jarai. Nowadays, you still need to have the special permit to allow to visit the local villages or to travel along the border in this region. Today you’ll stay overnight at a 2-star hotel. Kham Duc is known as an area with many gold mines in Vietnam after the war finished, but during the Vietnam war, it belongs to the Special Force Camps of the US army, some of Australian and AVNR were located to control the border between Vietnam, Laos, and Cambodia. To get there you will travel on the called Hochiminh Road. There are no original Ho Chi Minh trails here because they all are in Laos and Cambodia in this region. The ride will go through the deep jungles and the 1500-meter high mountains with some beautiful scenery and waterfalls along the way. You also visit some old battlefields at Dac To base, Tan Canh air base, Charlie hill, and Indochina border. You’ll stay overnight at a 2-star hotel. Once a major Southeast Asian trading post in the 16th and 17th centuries, the seaside town Hoi An is basically a living museum featuring a unique mixture of East and West in the form of its old-town architecture. Among the heritage architecture, there stand Chinese temples, a Japanese-designed bridge, pagodas, wooden shop-houses, French- colonial houses, and old canals. You travel here by the Ho Chi Minh road, visit the Kotu minority villages, waterfalls, and sightseeing on the way before check-in at your 2-star hotel in town. It’s your relaxing day. Maybe, you can go to the beach or just relax at the swimming pool of your hotel. You travel by the coastal road to the Marble Mountain, Da Nang bay, Hai Van Pass, Lang Co Beach, then arrive at your hotel in the center of Hue. From Hue, our team will travel by the small road up to the highlands to visit the Hamburger Hill, the Dak Rong Bridge, and Khe Sanh Base. You will stay overnight at a 2-star hotel here. From Khe Sanh, we will travel to visit The Rockpile, DMZ museum, Hien Luong Bridge, Vinh Moc tunnel, and then to Phong Nha where you’ll stay overnight at a hotel. It's a relaxing day. You can do a boat trip to explore the cave and do a short ride to explore the Ke Bang National Park. Along with this road, you will visit the untold Khe Gat airfield. You will stay overnight in a small village. This is your easy day on the easy road through the local villages to move up to North Vietnam. You’ll stay overnight in a small village without any Western tourist. Mai Chau is nestled between two towering cliffs and surrounded by emerald green paddies. It is an enchanting sight as you approach down the windy cliff side road and the villages and surrounding countryside present an idyllic rural scene that could easily charm you into staying longer than intended. The villagers in Mai Chau are mostly White Thai, distantly related to tribes in Thailand, Laos, and China. Most no longer wear traditional dress, but the Thai women are masterful weavers producing plenty of traditional-style textiles. Before you could get here, your team must travel on some the off-roads through the Pu Luong National Park with some very high mountains and very steep roads. You’ll do a homestay with a local family. Nghia Lo is the second largest rice-field valley in the north (the largest is Dien Bien Phu). The area of Nghia Lo is beautiful, with its large rice fields surrounded by high mountains. If you cross the rice fields, you arrive at torrent with hot water springs (old ladies bath in there, so be discreet please!). Mu Cang Chai is a nice and long pass on the mountain 1,000-meter high - it’s one of the greatest roads in Vietnam. There are approximately 30 ethnic groups. The Dao, Thai, and Hmong people are the biggest groups of this province. The harvest is from September until the end of October. These yellow rice-fields are recognized as a national scenic site as well as the unique cultural identities of the Hmong ethnic group. You travel here by small road along the Da River and stay overnight at the 2 stars hotel in the center of the local town. Sa Pa is located in Northwest Vietnam, close to the border with China. The Hoang Lien Son range of mountains dominates this area, which is at the eastern extremity of the Himalayas. This range includes Vietnam’s highest mountain, Fansipan, at a height of 3,143 meters above sea level. The town of Sa Pa is at an altitude of about 1,500 meters (4,921 feet) above sea level. The climate is moderate and rainy in summer (May - August) and it's foggy and cold with occasional snowfalls in winter. The scenery of the Sa Pa region in large part reflects the relationship between the minority people and nature. This is seen especially in the rice fields carpeting the rolling lower slopes of the Hoang Lien Mountain. The impressive physical landscape which underlies is resulted from the work of the elements over thousands of years, wearing away the underlying rock. You travel by the O Quy Ho road to the Sky Gate at a height of 2,000 m above sea level; it’s also one of the Greatest Roads in Vietnam. Check in at your hotel to stay overnight. Today is the day to explore the area of Sa Pa. You can choose to do the long trekking through the local villages and then do a home stay with the locals or just the half-day trekking and stay overnight at the hotel in the town. You continue to travel to some Red Dao ethnic minority villages by some off-roads and to Lao Cai, the border with China. From here, you travel down to the Red River and stay overnight in the small town. You’ll travel by the small roads along the Red River to Hanoi. For your safety, your tour leader will help you travel easier to the center of the city by the quiet roads. Arrive at your hotel and finish your trip. A more detailed description of the places you will visit can be found in the Location section. This tour will take place in Vietnam. During the tour, you will ride from Saigon to Ha Noi and visit lots of interesting places in Vietnam. The Mekong Delta was likely inhabited long since prehistory; the empires of Funan and Chenla maintained a presence in the Mekong Delta for centuries. Archaeological discoveries at Oc Eo and other Funanese sites show that the area was an important part of the Funan kingdom, bustling with trading ports and canals as early as in the first century AD and extensive human settlement in the region may have gone back as far as the 4th century BC. Angkor Borei is a site in the Mekong Delta that existed between 400 BC - 500 AD. This site had extensive maritime trade networks throughout Southeast Asia and with India and is believed to have possibly been the ancient capital of the Kingdom of Funan. The region was known as Khmer Krom (lower Khmer, or lower Cambodia) to the Khmer Empire, which likely maintained settlements there centuries before its rise in the 11th and 12th centuries. The kingdom of Champa, though mainly based along the coast of modern Central Vietnam, is known to have expanded west into the Mekong Delta, seizing control of Prey Nokor (the precursor to modern-day Saigon City) by the end of the 13th century. Author Nghia M. Vo suggests that a Cham presence may indeed have existed in the area prior to Khmer occupation. Beginning in the 1620s, Khmer King Chey Chettha II (1618-1628) allowed the Vietnamese to settle in the area, and to set up a custom house at Prey Nokor, which they colloquially referred to as Sai Gon. The increasing waves of Vietnamese settlers which followed overwhelmed the Khmer kingdom, weakened as it was due to war with Thailand, and slowly Vietnamized the area. During the late 17th century, Mac Cuu, a Chinese anti-Qing general, began to expand Vietnamese and Chinese settlements deeper into Khmer lands, and in 1691, Prey Nokor was occupied by the Vietnamese. To explore this old and hidden historic land, you will do some boat trips in My Tho to Ben Tre and visit the Khmer villages and their 1,000-year-old temples in Tra Vinh - Soc Trang. Here, farmers from the region bring their goods, fruits, and vegetables mainly to the markets and sell them to local dealers. These dealers sell the products to shops in the neighboring towns and to wholesale dealers from the big towns. All big boats have a pole. Each wholesaler hangs the goods he buys/sells on this pole. This way, people on small boats know where they have to go from a certain distance. In this case, this is a floating vegetable supermarket. On the floating markets, you do not only find people buying and selling goods but you also find floating restaurants, floating bars, floating gas stations, and many other floating shops. In 1904, Dak Lak Province was established by the French and Buon Ma Thuot (BMT) was selected as the provincial administrative center rather than the trading center of Buon Don on the Srepok River. BMT was originally settled by the Ede but due to the incoming Viet settlement after the Vietnam War and the active acculturation policy, less than 15% (around 40,000) are still Montagnards. An important battle took place there at the end of the second Vietnam War. The region saw its share of combat during the wars. A major battle between the south and north Vietnamese took place in and around Kon Tum in the spring of 1972. More recently, in 2004, there were protests against government policies in the highlands. Hill tribes in Kon Tum province clashed with police and soldiers. On the surface, things have cooled off, but relations between the hill tribes and the authorities remain fraught. Nowadays, you still need to have the special permit to allow to visit the local villages or to travel along the border in this region. Once a major Southeast Asian trading post in the 16th and 17th centuries, the seaside town Hoi An is basically a living museum featuring a unique mixture of East and West in the form of its old-town architecture. Among the heritage architecture, there stand Chinese temples, a Japanese-designed bridge, pagodas, wooden shop-houses, French- colonial houses, and old canals. Though large-scale, the trading had long moved elsewhere. Hoi An has been successful in preserving and restoring its charming roots. Hoi An was declared as a UNESCO World Heritage site in December 1999. Hoi An riverside is the best place to be at night as the area is lit by quaint and old-fashioned lanterns, making it an atmospheric and beautiful spot. For those who love sea, sun, and sand, Hoi An offers two lovely beaches five kilometers away from the town center, a sort of holiday within a holiday. Hoi An is known for its great food, fun shopping, skilled tailors, friendly people, and cozy atmosphere, all key characteristics that draw people to this picturesque town. In June 1802, Nguyen Anh took control of Vietnam and proclaimed himself Emperor Gia Long. His rule was recognized by China in 1804. Gia Long consulted with the Geomancers to decide which was the best place for a new palace and citadel to be built. After the Geomancers had decided on a suitable site in Hue, building began in 1804. In the early morning hours of January 31, 1968, as part of the Tet offensive, a division-sized force of North Vietnamese army and Viet Cong soldiers launched a coordinated attack on Hue seizing most of the city. During the initial phases of the Battle of Hue, due to Hue’s religious and cultural status, Allied forces were ordered not to bomb or shell the city, for fear of destroying the historic structures, but as casualties mounted in house-to-house fighting these restrictions were progressively lifted and the fighting caused substantial damage to the Imperial City. Out of 160 buildings, only 10 major sites remain because of the battle. The city was made a UNESCO site in 1993. The buildings that still remain are being restored and preserved. The latest and so far the largest restoration project is planned to conclude in 2015. US military presence at Khe Sanh began in 1962, when the U.S. Special Forces built a small camp near the village, located some 14 miles (23 kilometers) south of the demilitarized zone (DMZ) between North and South Vietnam and 6 miles (10 kilometers) from the Laotian border on Route 9, the principal road from South Vietnam into Laos. The battle of Khe Sanh was the iconic confrontation of the Vietnam War. The showdown recalled the celebrated 1954 siege of Dien Bien Phu, in which Vietnamese communist forces surrounded and eventually overran an isolated French stronghold. But unlike the French at Dien Bien Phu, the Americans maintained their fragile air link to Khe Sanh, and the combat base and its main outposts withstood communist bombardments and attacks until a relief force broke the siege in April. For the next 77 days, U.S. Marines and their South Vietnamese allies fought off an intense siege of the garrison, in one of the longest and bloodiest battles of the Vietnam War. Phong Nha is noted for its cave and grotto systems as it is composed of 300 caves and grottoes. A survey in 2009 brought the total discovered length of the cave system to about 126 kilometers, with many areas still not well explored. The Son Doang Cave, which was discovered in the 2009 survey by British and Vietnamese explorers, is considered the largest cave in the world. Even before this discovery, Phong Nha held several world cave records, including the longest underground river as well as the largest combined caverns and passageways. The park derives its name from Phong Nha Cave, containing many fascinating rock formations, and Ke Bang forest. The plateau on which the park is situated is probably one of the finest and most distinctive examples of a complex karst landform in Southeast Asia. This national park was listed on UNESCO’s World Heritage sites in 2003 for its geological values as defined in its criteria VIII. In April 2009, the world’s largest cave was rediscovered by a team of British cave explorers of the British Caving Association led by a local farmer. During the Vietnam War, the North Vietnamese fighters took off from Khe Gat airfield near Phong Nha National Park for North Vietnamese air attack on the United States battleships on South East Asia Sea in an air raid known as Battle of Dong Hoi. This airstrip was where Ho Chi Minh landed for his North Vietnamese southernmost visit ever to Quang Binh during the Vietnam War, he landed here at 8:30 am June 16, 1957. It was also where the North Vietnamese prime minister Pham Van Dong and Cuban president Fidel Castro landed for a visit to the newly occupied zone by North Vietnam of Quang Tri in 1972. General Van Tien Dung also landed here before entering South Vietnam for direct command of communist forces in the last period of Vietnam War renowned as Ho Chi Minh Campaign in 1975.